Basically, this is the third iteration of Strangetown. I'll first tell you about the two "failed" versions, as I still miss them a bit, and I'll introduce the next version in a new post. I first started with an ISBI legacy. 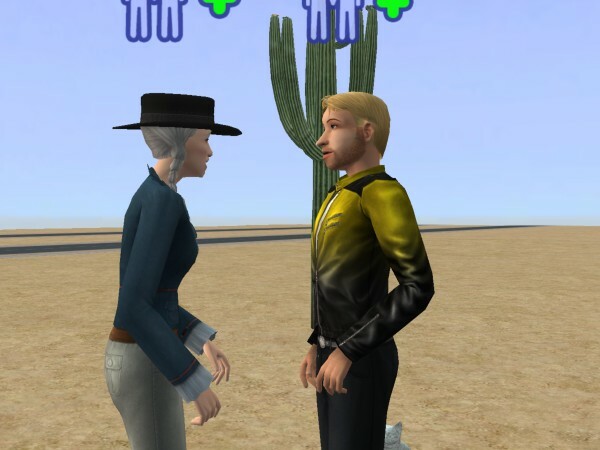 ISBI stands for "I'm surrounded by idiots", where you basically control one sim, and one sim only - everyone else - sons, daughters, spouses, grandparents - are left to their own devices. - I'm not strong-willed enough! I was mostly fine while I wasn't too attached to my "idiots"... but then I started giving them "just one order" so that they wouldn't flunk school, or so they would get that skill point I couldn't get them to get otherwise. Bleh. It slowly turned into a legacy-light, but it taught me to leave my guys on free will a lot more than I used to. 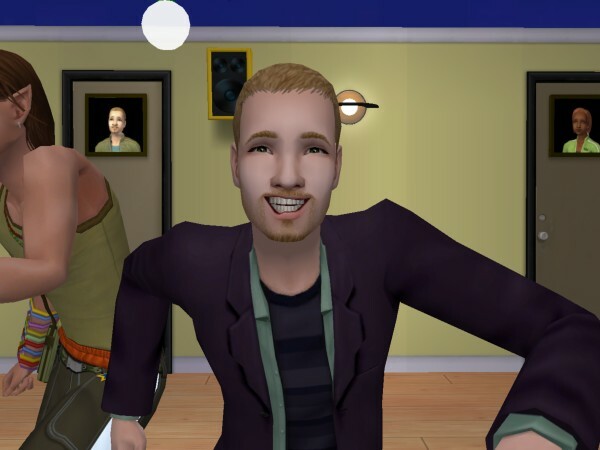 - My founder, Surprise Surprise, fell in love with Phil Jitmakusol (three bolts and all), married him... had three ugly kids with him... and the next generation was even uglier. I mean, seriously ugly, to the point that Pollination Tech #9 looked like a top model in comparison. And they all had the same, horrible personality - basically ugly, nasty clones of each other. I hadn't heard of the "first-born syndrome" at that point. Phil makes ugly kids, but he's a wonderful father and grandfather. I didn't even take pics of the kids. After meeting the 3rd generation, I decided to cut my losses and restarted. I had also found mods like ARC by then. Flykra and Grimhild aren't on the picture but they were basically clones of Svanhild with different haircuts. You'll notice I didn't know about tabbing to take better pictures. One learns new things everyday! This is Darren, Deirdre, and their youngest daughter, Flykra. That was just before she left for Uni. Duanan at Uni. Maybe not his most flattering picture :-P. You can see a bit of Marvin in the background, but you'll meet him in the third iteration anyway. He's Flykra's love interest. And Duanan's (thank you ARC). And everyone else's on the campus, really. He didn't manage to become the Big Man on Campus - that honour went to Duanan. The children were born in that order: Duanan, twins: Nuala and Laurina, Grimhild, Svanhild, and finally Flykra. Four were affected by first-born syndrome, personality-wise: Duanan and the last three girls, but they were FANTASTIC! Reasonably neat but not freakishly so, very outgoing, very active, serious, and reasonably nice. I basically hit the jackpot with them. They lived up to their name, too. - One highlight among many: Surprise Surprise decided to have a looksie through the telescope (which she'd barely touched until then), and just like that, was abducted at the ripe old age of 84. :-D One last night in the stars to see if she could find Phil. She may have, because she died the next day. - Another surprising development: I wasn't going to send all the kids to Uni. Duanan was going, and I wanted one of the three younger girls with him (Nuala was boring, and Laurina... was just okay). In the end it was a toss-up between Svanhild and Flykra. I had a slight preference for Svanhild, but she looked too much like Deirdre while Flykra was a better blend of both parents. So Flykra went to Uni. 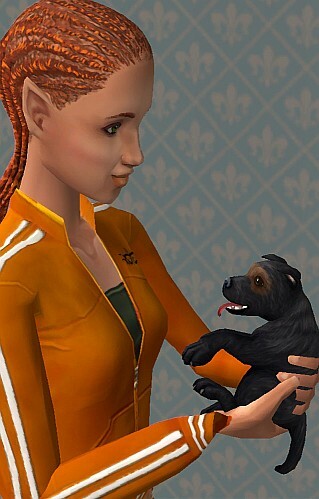 My lovely Svanhild moved in with her adult sisters, adopted a puppy... and died in a fire that very same night. Ouch. That really did hurt, let me tell you! 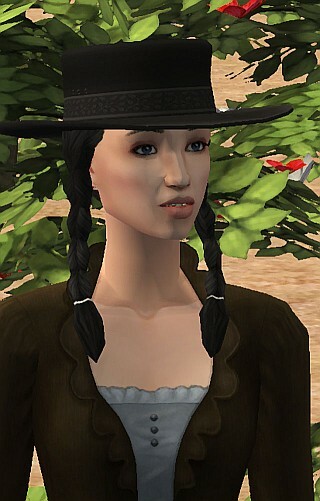 That's how I'll remember her :-) Svanhild, my really, really sweet Fortune sim. 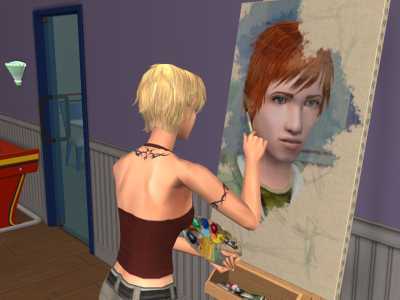 In the process, I had also started playing the Maxis family - in particular the Beakers and the Curious. I was having great fun, but I had to mess it all up by replacing my Multi PT... and completely removing the old Pollination Technicians. Hint: don't do that. Multi PT mods come with 5 scripts: 4 character files, and a controller package. If you want to change your PTs, delete the old controller package, but **keep the character files**. Otherwise you'll end up corrupting your neighbourhood. Loki Beaker's daughter, Cassiop, lost her alien parent. I wasn't able to fix it in SimPE - it kept throwing errors whenever I tried to edit Cassiop's family ties.